Art In Hand: The Streak! 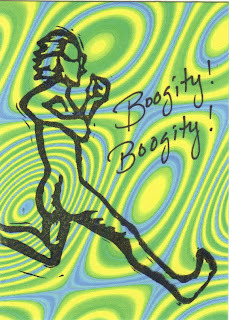 Artist & Letterboxer Trading Cards by "dixie" & daughter "Mojo"
I started doing LTCs & Artist Trading Cards in August of 2008. I hand carve rubber stamps and some of my cards will use images from those. I am a beginner in watercolor arts and some other media. All of my cards are handmade. They are not "prints". My original watercolors are here at Art In Hand. The carving was done for my friend turtlelove and the Purple People Eater event featuring a theme of funny songs. The Streak was a favorite when i was a kid. It got plenty of air play on the old AM radio stations. Boogity! Boogity!